We bring to the attention of our readers the research conducted under the auspices of BioInitiative 2012 on the health impacts of environmental exposure to low intensity electronic radiation. This is a global concern. Potentially the entire planet is affected. 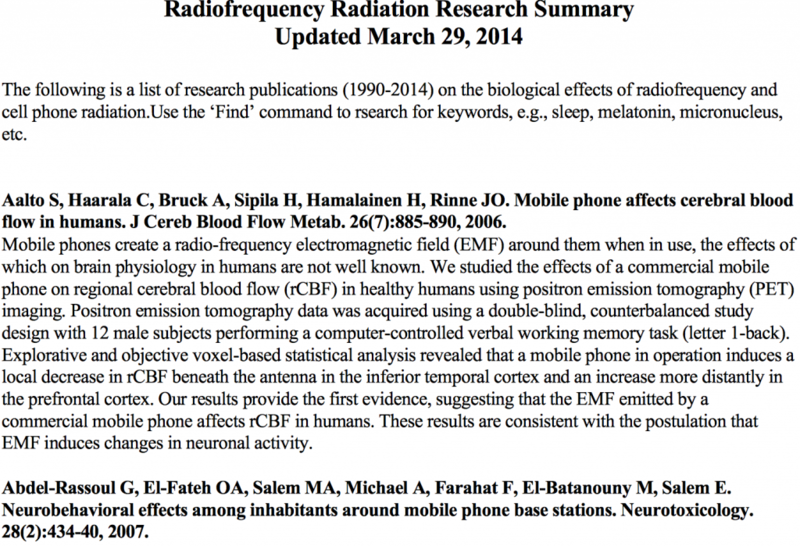 The health impacts of EMF and RFR radiation has been the object of media cover-up despite the results of scientific research. Wireless communication is everywhere. The public must be informed. Debate on this issue is of crucial significance in view of the introduction of the multibillion 5G network, and its potential health impacts. There is so much money involved. That is why nobody wants to address the health issues. The 5G network will be the object of subsequent articles. It may be interfering with ones’ ability to become pregnant, or carry a child to full term, or result in brain development changes that are bad for the child. It may be these exposures play a role in causing long-term impairments to normal growth and development of children, tipping the scales away from becoming productive adults. We have good evidence these exposures can damage our health, or that of children of the future who will be born to parents now immersed in wireless exposures. In the United States, the deployment of wireless infrastructure (cell tower sites) to support cell phone use has accelerated greatly in the last decades. The spread of cell towers in communities, often placed on pre-school, church day-care, and school campuses means that young children can have thousands of times higher RF exposures in home and school environments that existed even 20-25 years ago. CTIA estimates that in 1997 there were only 36,650 cell sites in the US; but increased rapidly to 131,350 in June 2002; 210,350 in June 2007 and 265,561 in June 2012 (CTIA, 2012). About 220,500 cell sites existed in 2008. These wireless antennas for cellular phone voice and data transmission produce whole-body RFR exposures over broad areas in communities that are an involuntary and unavoidable source of radiofrequency radiation exposure. Further, the nearly universal switch to cordless and cell phones, and away from corded landline phones means close and repetitive exposures to both EMF and RFR in the home. Other new RFR exposures that didn’t exist before come from WI-FI access points (hotspots) that radiate 24/7 in cafes, stores, libraries, classrooms, on buses and trains, and from personal WI-FI enabled devices (iPads, tablets, PDAs, etc). The largest single source of community-wide, pervasive RFR yet rolled out is the ‘smart meter’ infrastructure. This program places a wireless device (like a mini-mobile phone base station) on the wall, replacing the electromechanical (spinning dial) meter. They are to be installed on every home and classroom (every building with an electric meter). Utilities from California to Maine have installed tens of millions already, despite health concerns of experts and enormous public resistance. The wireless meters produce spikes of pulsed radiofrequency radiation 24/7, and in typical operation, will saturates living space at levels that can be much higher than already reported to cause bioeffects and adverse health effects (utilities can only say they are compliant with outdated federal safety standards, which may or may not always be true – see http://sagereports.com/smart-meter-rf). These meters, depending on where they are placed relative to occupied space in the home or classroom, can produce RFR exposure levels similar to that within the first 100 feet to 600 feet of a mobile phone base station (cell tower). The cumulative RFR burden within any community is largely unknown. Both involuntary sources (like cell towers, smart meters and second-hand radiation from the use of wireless devices by others) plus voluntary exposures from ones’ personal use of cell and cordless phones, wireless routers, electronic baby surveillance monitors, wireless security systems, wireless hearing aids, and wireless medical devices like implanted insulin pumps all add up. No one is tallying up the combined exposure levels. Billions of new RFR transmitters from the smart meter rollout alone will raise the baseline RFR levels, and will significantly add to the existing RFR background. Sometimes, science does not keep pace with new environmental exposures that are by-products of useful things we want to buy and use in society. So, the deployment runs ahead of knowledge of health risks. It is an old story. This is the case for EMF and RFR, and this Report underscores the critical need to face difficult questions, make mid-course corrections, and try to repair the damage already done in this generation, and to think about protecting future generations. The global conversation on why public safety limits for electromagnetic and radiofrequency fields remain thousands of time higher than exposure levels that health studies consistently show to be associated with serious health impacts has intensified since 2007. Roughly, 1800 new studies have been published in the last five years reporting effects at exposure levels ten to hundreds or thousands of times lower than allowed under safety limits in most countries of the world. Yet, no government has instituted comprehensive reforms. Some actions have been taken that highlight partial solutions. The Global Actions chapter presents milestone events that characterize the international ‘sea change’ of opinion that has taken place, and reports on precautionary advice and actions from around the world. The world’s populations – from children to the general public to scientists and physicians – are increasingly faced with great pressures from advertising urging the incorporation of the latest wireless device into their everyday lives. This is occuring even while an elementary understanding the possible health consequences is beyond the ability of most people to grasp. The exposures are invisible, the testing meters are expensive and technically difficult to operate, the industry promotes new gadgets and generates massive advertising and lobbying campaigns that silence debate, and the reliable, non-wireless alternatives (like wired telephones and utility meters) are being discontinued against public will. There is little labeling, and little or no informed choice. In fact there is often not even the choice to stay with safer, wired solutions, as in the case of the ‘smart grid’ and smart wireless utility metering, an extreme example of a failed corporate-governmental partnership strategy, ostensibly for energy conservation. A collision of the wireless technology rollout and the costs of choosing unwisely is beginning and will grow. The groundwork for this collision is being laid as a result of increased exposure, especially to radiofrequency fields, in education, in housing, in commerce, in communications and entertainment, in medical technologies and imaging, and in public and private transportation by air, bus, train and motor vehicles. Special concerns are the care of the fetus and newborn, the care for children with learning disabilities, and consideration of people under protections of the Americans With Disabilities Act, which includes people who have become sensitized and physiologically intolerant of chronic exposures. The 2012 Report now addresses these issues as well as presenting an update of issues previously discussed..